I’m not really a guy who is into the whole anime pilgrimage thing. It’s pretty easy to blame “Lucky Star” and the many anime fans that still go to Washinomiya Shrine in Saitama prefecture for this whole anime pilgrimage movement. But if anime studios didn’t base their designs on real life towns and buildings, you’d not have this problem. Then again you don’t hear from many towns complaining about the otaku dollars as they cash in by selling merchandise. 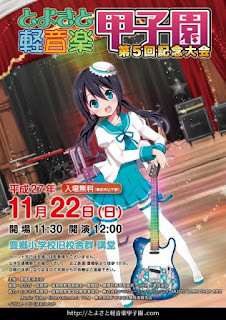 Regardless I did decide on my last trip to Osaka in November 2015 that I would go check out the Toyosato Elementary School which was used as a basis for Sakuragoaka Girl's High School in the anime “K-On!”, a show which I had really come to love in the last few years. The main problem with going to the small township of Toyosato (with a population of just over 7,500) is it is really out of the way on a small private railway and hard to get to. 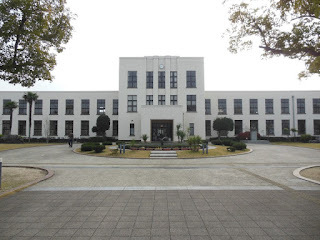 If you have the cash, probably the best way is get a rental car and travel the 116 km from Osaka to the school which will take you a bit over one and a half hours. Naturally there are toll booths along the way which are bit hard to dodge, so it’s a bit expensive. Option two is to take the train, which is also a bit of a pain in terms of time and hassle. From Osaka station, take the Japan Rail (JR) Special Rapid Service bound for Nagahama and get off at Hikone station. Here is where fun starts as you’ll have to transfer to the Ohmi Railway Line, which is a private company which still doesn’t use IC cards (i.e. reusable tap on and off travel cards like Opal and Myki etc. ), so your ICOCA card is going to be useless here. It’s time to break out your Japanese skills and ask the guy ant the counter for a return ticket to Toyosato station. 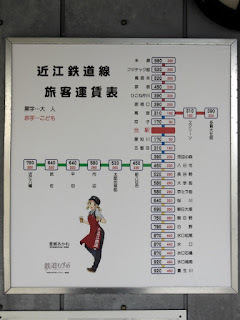 Also note that depending on the time of day, the trains going to Toyosato from Hikone only run once an hour (about 35 minutes past the hour) and half an hour in peak hour times. 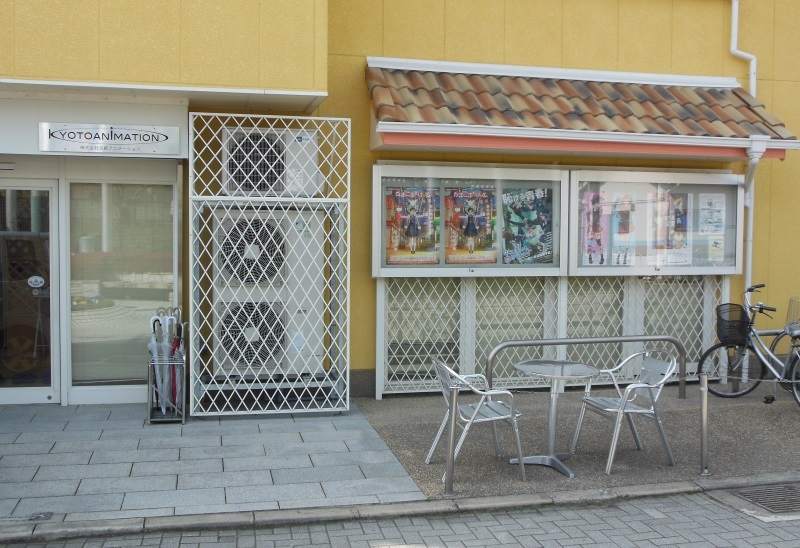 Also note that Toyosato station is unmanned. When you get off the train, go to the first carriage and show the conductor your ticket. Otherwise he will chase you down when you leave. Like he did to me… In total the trip from Osaka station takes around two hours. Please be aware of the amount of time the whole trip takes. You may not want to waste more than half a day to look at what is a school. If you have a Japan Rail Pass, get the Shinkansen from Shin-Osaka station to Maibara station, then take the Ohmi Railway Line to Toyosato station to shave about 20 minutes off your travel time. 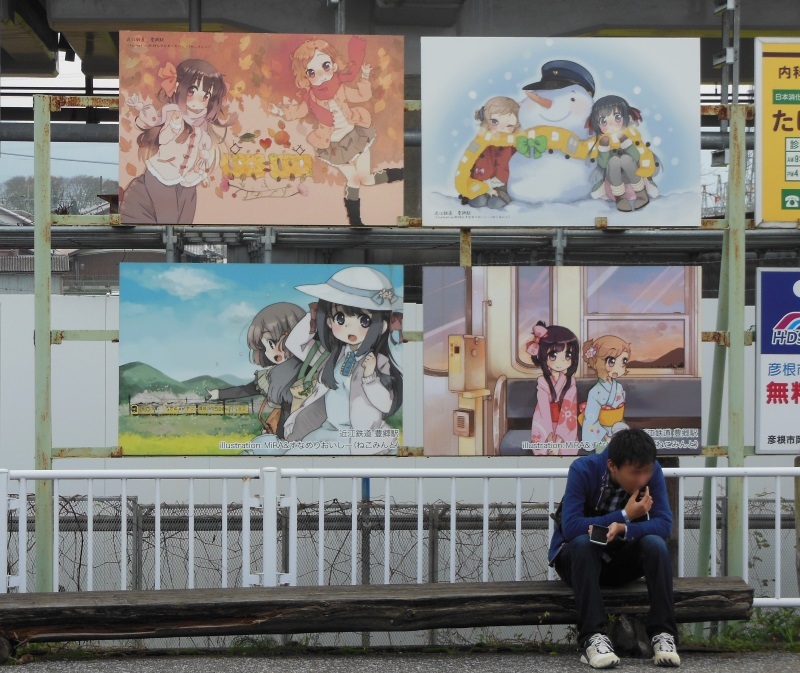 The train line and the township itself have cashed in on the otaku boom. Above you can see the timetable for the train which includes an anime style conductor. Above is a set of illustrations depicting the four seasons above the platform, also commissioned by the railway. Stepping outside the station, you’ll notice there isn’t anything around in the way of amenities at all. There is a bakery on the left hand side of the street, but it was closed on the day I went. There are no convenience stores within miles (and no restaurants from memory), so bring any food and drink with you if you plan to make a day of it. There are some drink vending machines next to the bakery. To get to the school is pretty easy. Walk around 250 meters straight ahead from the entrance of the station to a T-junction. Turn right and walk a further 650 metres (passing the police station and town offices) and you’ll be right in front of the school. Along the way you’ll pass several “tobidashi boys” which are essentially warning signs for motorists that a school is nearby and to look out for children. The difference in Toyosatao is that most of these signs have been changed to look like super deformed characters from “K-On!”. 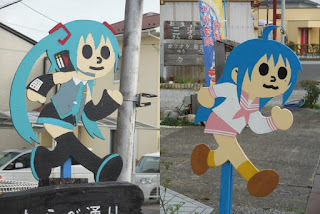 There’s even a Hatsune Miku version and a Konata Izumi (“Lucky Star”) version. Note that school itself is open from 9am to 5pm. Entry is free. Sometimes the school is closed for special events. Check this Japanese blog called “Clubrooms of Today” for any closures or special events before you make the trip. 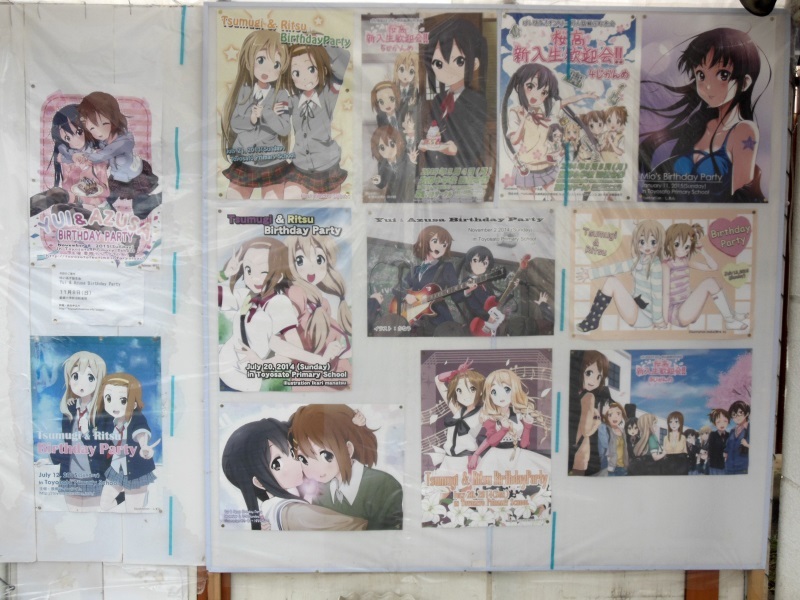 Besides its inclusion in “K-On!”, the school has quite an interesting history. It was built in 1937 through donations made by philanthropist Tetsujiro Furukawa, the general manager of Marubeni Shoten. 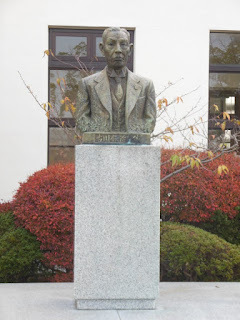 His statue appears outside the main school building and is featured heavily in “K-On!”. The buildings were designed by a local American architect William Merrell Vories. Vories who had moved to Shiga prefecture in 1905 as a Christian missionary. 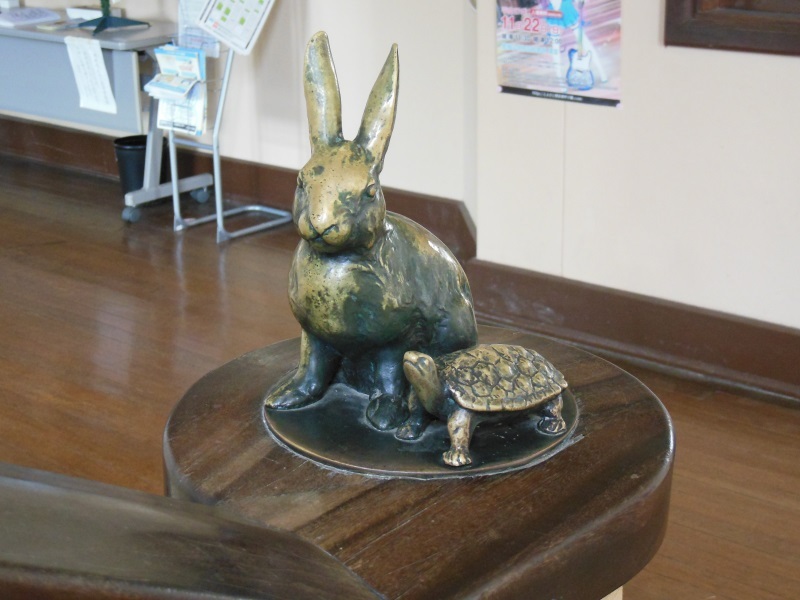 On the hand rails in the stairwell of the main building are small brass statues of hares and tortoises which illustrate Aesop's fable of “The Tortoise and the Hare”. The story starts at the bottom and finishes at the top where the tortoise wins and the hare can be found asleep half way up. 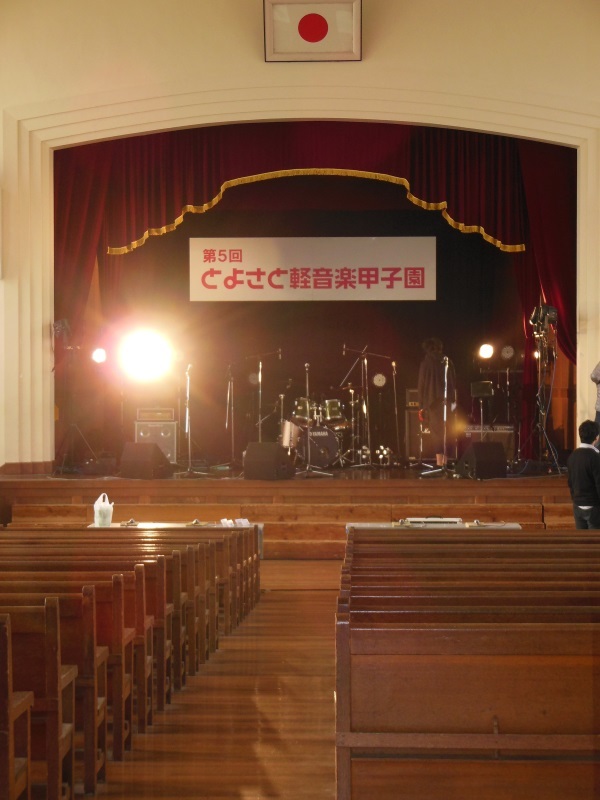 Apparently Vories suggested the motif for the school and Furukawa approved it remembering his childhood teacher has encouraged him using the story. In 1999 it was decided that the school no longer was up to scratch in terms of being earth quake proof. The local mayor announced a new school building and the old school was to be demolished. This did not go over well with the locals. In 2001 they got an injunction to halt any demolition of the school. However the local council fought back and there were even protests at the site which turned violent (well a bit of pushing and shoving at the very least). Eventually in 2004 the council decided to preserve the school and all its buildings, only after the mayor was defeated in a 2003 election. The main building is where the club room for the fictional Light Music Club resides. Once you take your shoes off at the entrance and find some slippers which actually fit (this is compulsory for all buildings at the school) at the top of the closest staircase is the room. When I visited, I noted that many of the items I had seen in other fan’s photos online were no longer there. All the instruments were gone and the Gamera “Ton-chan” had been removed and replaced with a crappier ordinary plastic turtle. However all of the costumes Sawako had made for the girls are still there, as well as replicas of other items that appeared in the anime. If you return to the entrance of the building walk out to the pathway which connects the two annex buildings at either end of the main school building, turn right and go to the annex at the end of the path. In this smaller building you’ll find where most of the items in the club room went. All of the donated instruments have been moved here which join a collection of figures, some more costumes and a ton of other fan made paraphernalia. The locals also sell some regional merchandise, mostly stuff specifically made for the school, including t-shirts. 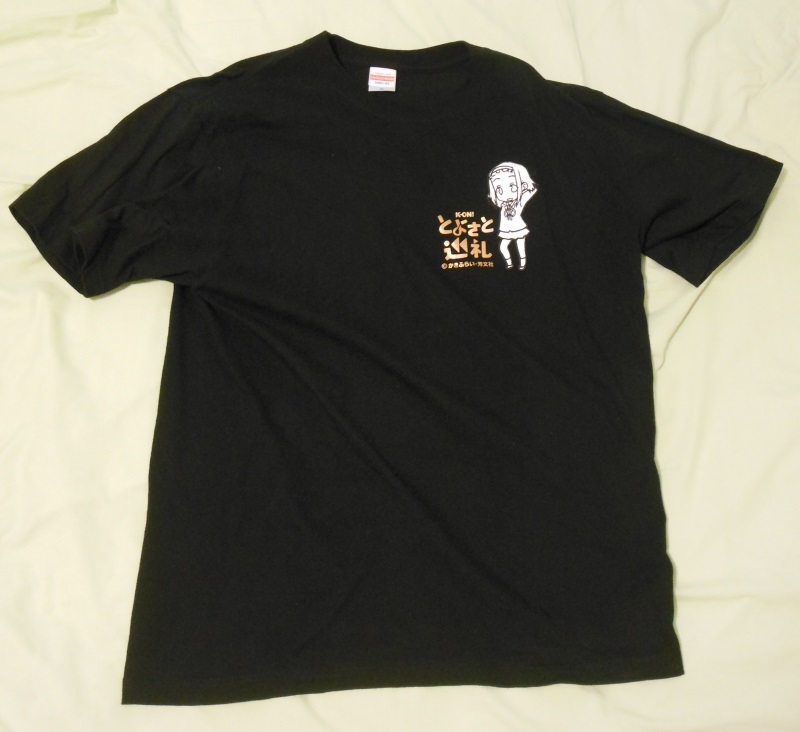 I bought a Ritsu Toyosatsu School t-shirt (above). They were selling t-shirts with super deformed versions of all five light music club members. When I was on the train I noticed a number of high school aged kids in uniform some with musical instruments, some without. It was the Sunday of a long weekend (22 November 2015, Labor Thanksgiving Day was on the Monday) and the 5th Annual Toyosato Light Music Championship was apparently on that same day. I was finally tipped off by the flyers around the township and next to the merchandise on display in the annex at the school. One of the guys setting up came to talk to me and we had a slightly awkward discussion in half broken English and my barely functional and very broken Japanese (and also suffering from a head cold). From what I understood a number of local high school bands battle it out over a few hours. There are a couple of trophies, one sponsored by the local NHK station. Unfortunately I had a ticket for the shinkansen from Maibara station to Kobe, so I couldn’t hang around for the 12pm start. I took a quick shot of the school stage where the event was to take place. 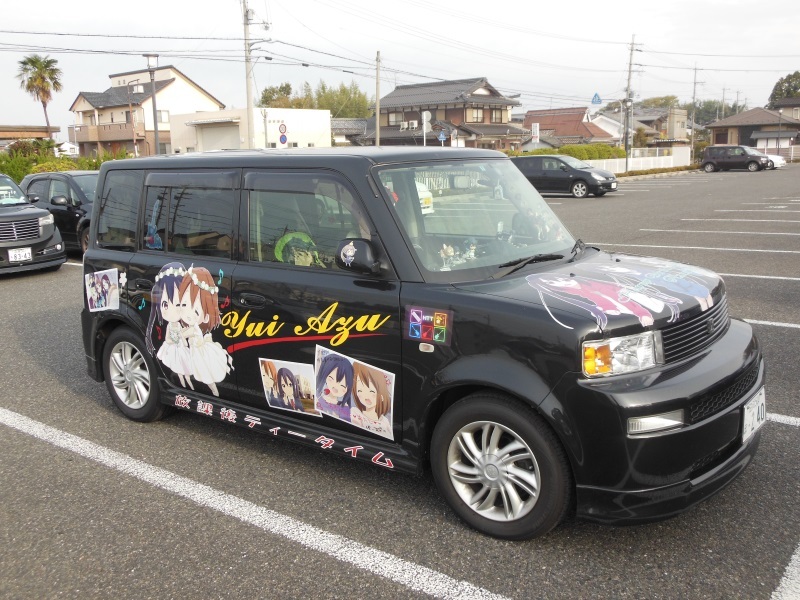 A couple of fans in their Itasha cars had shown up for the show in the parking lot. On the way back to the station, I spotted a notice board with posters for today’s event and previous events held at the school. 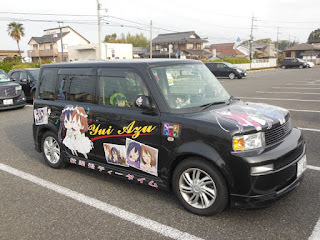 Next it’s off to Kyoto Animation’s main studio in Uji, Kyoto. Again, I stress to be aware of the Ohmi Railway Line timetable for Toyosato station as at times the train only leaves once an hour. I would also check Hyperdia before you leave for the optimal time in terms of transfers. We’ll be going to Kohata station which will be two transfers and can take anywhere from a bit over 100 minutes to two and a half hours. Take the train from Toyosato to Hikone station, transfer to the JR Special Rapid Service for Aboshi or Banshuako and then change again at Kyoto station for the JR Nara Line bound for Nara or Joyo. Get off at Kohata station. 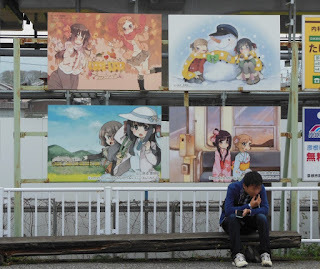 Kyoto Animation is pretty much right outside the station’s entrance. Just turn left once you exit the station and walk about 10 or 20 meters and you’re there. I shouldn’t have to say this, but for god’s sake don’t go in. It’s not open to the public. However the studio does have a KyoAni Shop not far away. Walk back past the station until you get to a T-junction (around 85 meters). Turn left and walk a further 290 meters going over the Keihan Uji Line (past Kowata Station) and a 7-Eleven. You’ll see a brown brick building with spiral stairs. 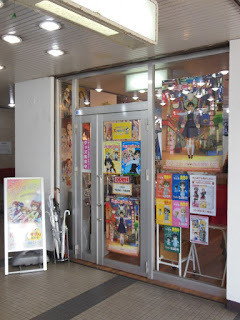 Go up one flight of stairs and you’ll find the KyoAni Shop next to a hairdresser. It’s usually open from 10am to 6pm, but I think closes around 4pm on weekends. It’s kind of small and once you get a few people in there it’s hard to move about. Personally I didn’t think much of the merchandise on offer when I was there. There was only merchandise for shows that had just finished screening or current shows. Then again I’m not really the biggest fan of the studio. I bought a couple of “K-On!” artbooks and that was it. On reflection I could have just bought the books from Mandarake in Osaka, possibly for a little cheaper. Note that I didn’t visit both the school and studio on the same day. I originally went to Uji back in March 2013 after I had visited Fushimi Inari-taisha and Kinkaku-ji in Kyoto. 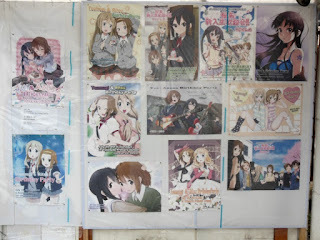 I think visiting the Toyosato school and Kyoto Animation is great for fans of “K-On!” and the studio, however it does take a big chunk out of your day to get to these places, which I found to be a major factor in deciding to go. 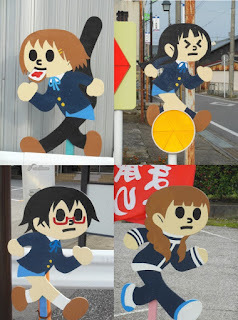 Next time I’ll be heading out to the Tezuka Osamu Manga Museum in Takarazuka, Hyogo Prefecture.